If you’re one of those people who hate Christmas music, this is the fact you’ve probably been waiting to throw in the faces of festive enthusiasts. 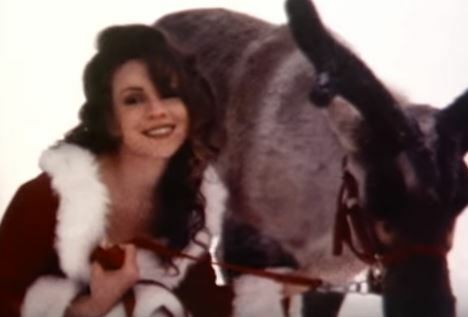 Apparently, listening to festive tunes is actually bad for your mental health. Now, you try telling me how the hell Fairytale of New York is supposed to be in any way bad for me? Ok, so apparently it’s bad if it’s played ‘too loud’ and ‘too early’. Music goes right to our emotions immediately and it bypasses rationality. Christmas music is likely to irritate people if it’s played too loudly and too early. It might make us feel that we’re trapped – it’s a reminder that we have to buy presents, cater for people, organise celebrations. And this will come as absolutely no surprise to find out: if you work in retail and have Christmas songs on a loop all day, that’s not good for you either. People working in the shops at Christmas have to tune out Christmas music because if they don’t, it really does stop you from being able to focus on anything else. You’re simply spending all of your energy trying not to hear what you’re hearing. Music psychology researcher, Dr Victoria Williamson backed this research up, explaining the ‘U-shaped relationship’ between the amount of times we hear music that we like and our ‘subsequent reaction to it’, writes Cosmopolitan. She says the first few renditions of the Christmas playlist can put people in a great mood, but after a while it can wear you down. While the research has come from a viable source and it actually makes a lot of sense, I’m not sure John and Jean Copestick got the message. 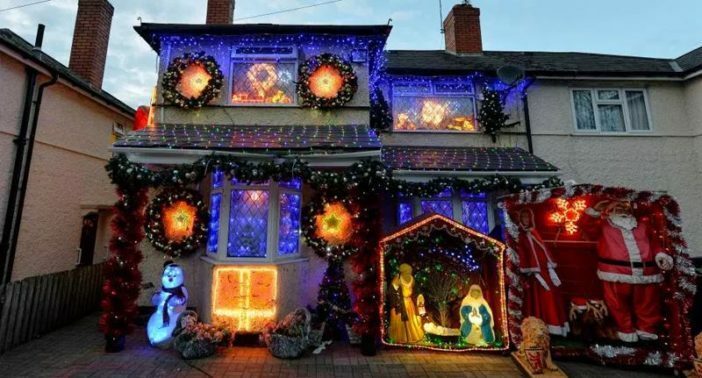 Getting into the Christmas spirit early, the couple, both 74, began decorating for the season at the end of September and now have more than 10,000 Christmas lights in and around their house. 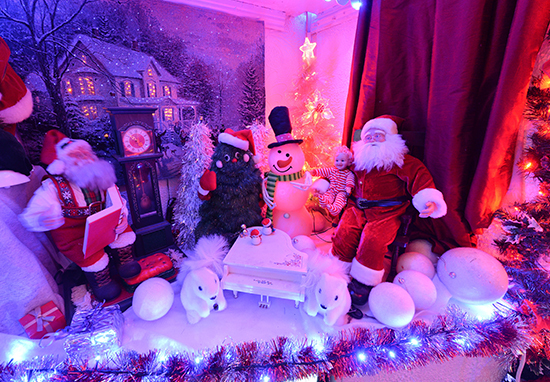 They’ve spent around £7,000 on decorating their semi-detached property in Stirchley, Birmingham with snowmen, tinsel, flashing lights, a giant Santa Claus and a whole lot of fairy lights. We’ve been doing it about 30 years, maybe longer. A lot of it is for the children at the local schools who come every year to see it, that’s mostly why I like to do it. The teachers bring them, sometimes they bring the special needs children where my lads went to school – they used to bring a coach load of them. I know it’s a little early – but we just love Christmas. If you saw their faces when they walk in you’d understand, especially the little ones. They think its just magic. 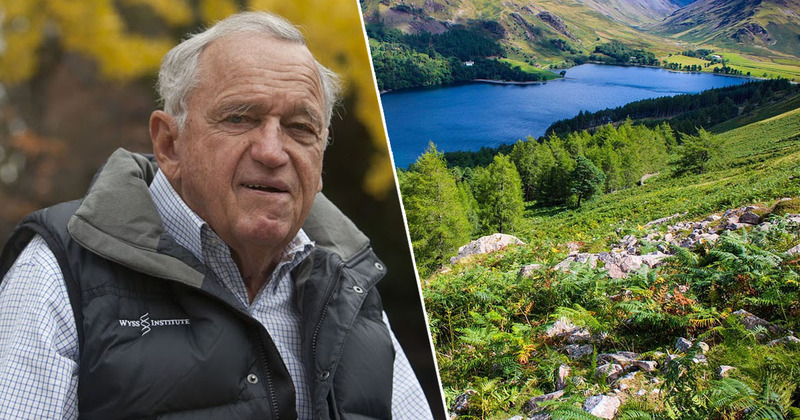 The couple live with their two foster sons, aged 27 and 25. 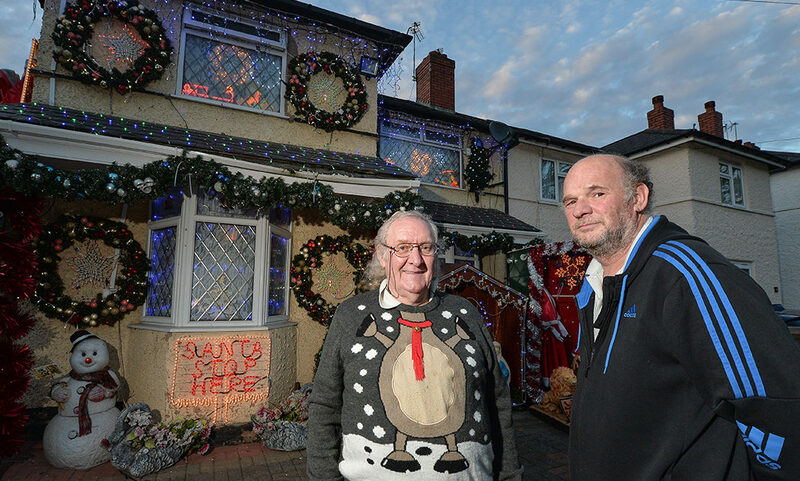 Their oldest decorations are about 32 years old but the couple love to buy new tinsel and trimmings each year. The decorations we’ve got in the back garden, you can’t buy them anymore. So I have to keep on patching them up as best as I can. People think they are amazing but some think we’re showing off. We aren’t. If you don’t like them then ignore them. My wife would have them up all year round if she could – she loves it. Now I’m a massive fan of Christmas but even that’s a bit early for me.